Raising hens on pasture has unique problems. Predators being a major one. In our area, these can include foxes, raccoons, coyotes, domestic dogs, hawks, and eagles. Most pastured eggs producers use mobile electric netted fence to keep their hens safe. It works well for predators approaching by land, but most of our problems have been from predators in the sky. 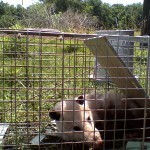 A mobile fencing system will not work for air predators unless you are able to cover the top of your enclosure. Nearly impossible. Additionally, our farm has very few level spots which make mobile fencing challenging. Last year we had major losses to our flock from hawks and bald eagles; and there is not much we could do to protect them. 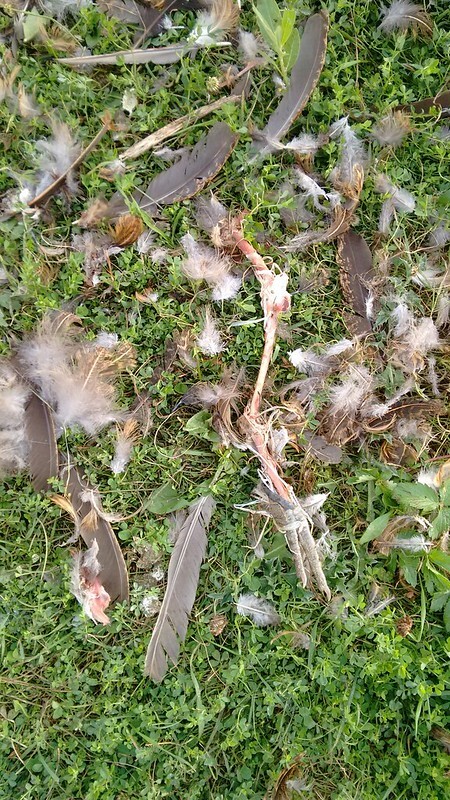 This is what was left after a bald eagle attack last year, basically feathers and feet! 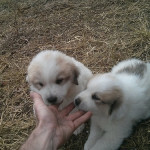 Enter livestock guard dogs, Anna and Elsa. Adorable, huh? But not too ferocious in this picture. We got Anna and Elsa in September 2015. They were promptly named by a certain “Frozen” crazed 3 year old. 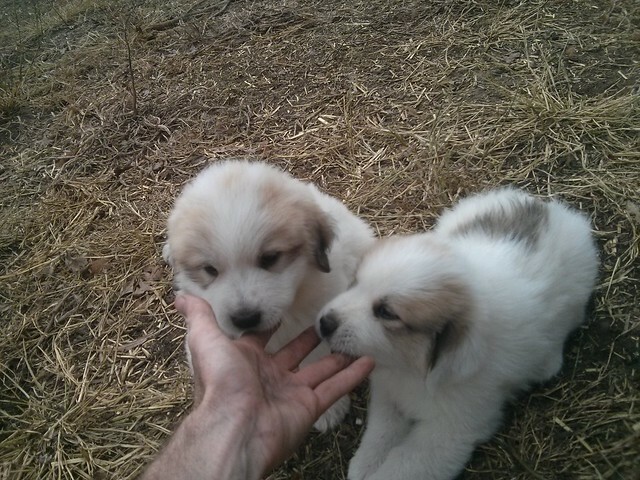 Anna and Elsa are Great Pyrenees, a breed known for being well suited to guarding livestock. They have been a wonderful addition to our farm. The breed is slow to mature and they still have training to do, but we love their gentle nature and protectiveness. Elsa, on the left. Anna on the right, sleeping on the job. Our first challenge was to discipline ourselves into treating them like working dogs, not pets. We are dog people and this was hard. 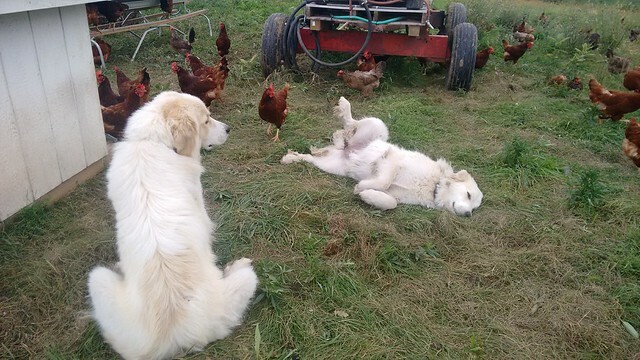 Livestock guard dogs must be trained that the chickens are their “tribe”, so ours live with the chickens 24/7. 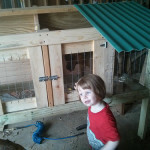 Even in winter, they stay with the chickens in the coop. It is quite a symbiotic relationship. I have witnessed the chickens “grooming” the dogs by pecking burrs from their coats. The best part? We have had no losses due to flying predators this year. I have seen (and heard) eagles flying overhead, especially the past couple of years. My chickie ladies generally get under a pine tree or hightail it to the coop. But this late summer, I’ve noticed something I’ve never seen around here in 18 years, a big red fox. A very brave one too, sauntering through our backyard (just N of you) during the light of day. I happened to look out our deck door and saw it crouched by our lilac bushes, the chickens only about 200 ft from him/her. They were frozen in place. I went out on the deck immediately to scare it off, but it did not run, it sauntered and looked at me the whole time. One brave, and apparently not too hungry, fox! We have seen it around here 3 more times since then, once in daylight and 2 times at twilight or dark (more over in our neighbors yard where there is a pond and he drinks from it). Have you seen a brave fox like this around your farm lately? Eagles and hawks are mostly a problem out in the pasture where there is little tree protection. Chickens wander too far from their coop and get into trouble. I haven’t seen the fox, but one of your neighbors caught one with one of our chickens in it’s mouth. He shot at it with a pellet gun to scare it off and saved the chicken. He said it was a pretty rough looking fox, so don’t know if it was the same one. Hope this is ok to ask here but do you guys sell chicken feet? I am getting into broth making and am looking for a local source for them. 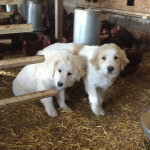 Awesome story about your livestock dogs!! I hope they keep doing a great job.